OF all the mysterious depths in Christian Religion, there is none more necessary for our information nor more influential upon our practice, than a right apprehension and a distinct knowledge of the Doctrine of the Covenants. For, if we be ignorant or mistaken in this, we must needs be liable to false or confused notions of the Law and the Gospel; of our Fall in Adam, and Restoration by Christ; of the true grounds of men's Condemnation, and the means and terms of their Justification; of the Justice of God in punishing sinners, and his glorious Mercy in saving believers: and, consequently, neither can many perplexing doubts and questions be resolved, the necessity and yet different concurrence of faith and obedience unto salvation cleared, the utter insufficiency of our own righteousness to procure acceptance for us with God evinced, his justice vindicated, nor his grace glorified. For all these great and important truths will readily own themselves to be built upon the foundation of God's covenant and stipulation with man; as I hope to make appear in our farther progress. And yet, though this doctrine be thus generally serviceable both to knowledge and practice, how many are there, who call themselves Christians, that are grossly ignorant of these transactions between God and man! that know not upon what terms they stand with the Almighty; nor what they may expect, according to the tenor of their mutual compact and agreement! This, therefore, I shall endeavour to treat of, as briefly and as clearly as the subject will permit, from the words which I have now read unto you; which are the transcript and copy of those Two great Contracts made between Heaven and Earth, God and Man: the one, from the beginning of his being, and that is the Covenant of Works; the other, immediately upon his fall and ruin, and that is the Covenant of Grace: the one, called here the Righteousness of the Law; and the other, the Righteousness of Faith. But, before I can particularly treat on this subject, I must first shew you what a Covenant is, in its general notion; and whether there is or can be any such thing as a proper covenant, between God and Man. Our English word Covenant seems to be borrowed from the Latin convenire or conventus; which signifies a mutual agreement and accord, upon conditions propounded and accepted by the parties concerned. And it may be thus described: A covenant is a mutual consent and agreement entered into between persons, whereby they stand bound each to other to perform the conditions contracted and indented for. And thus a covenant is the very same thing with a contract or bargain. Now to a strict and proper covenant there are two things presupposed. First. That, in the persons contracting, there be a natural liberty and freedom the one from the other; that is, that the one be not bound to the other as to the things covenanted for, antecedently to that compact or agreement made between them. For where an obligation to a duty is natural, there it cannot be strictly and properly federal, or arising from a covenant. If children should indent with their parents to yield them obedience upon condition that they on their part will afford them fit and convenient provision, this cannot, in strict sense, be called a covenant; because neither of the parties were free from the obligation of a natural law, which obliged them antecedently to this compact. In a proper covenant, the things promised by each party must be due, only upon consent and agreement: so that there must be an equality of the persons covenanting, if not in other respects, yet in respect of that for which they do covenant, that the right of both in what they mutually promise be equal. 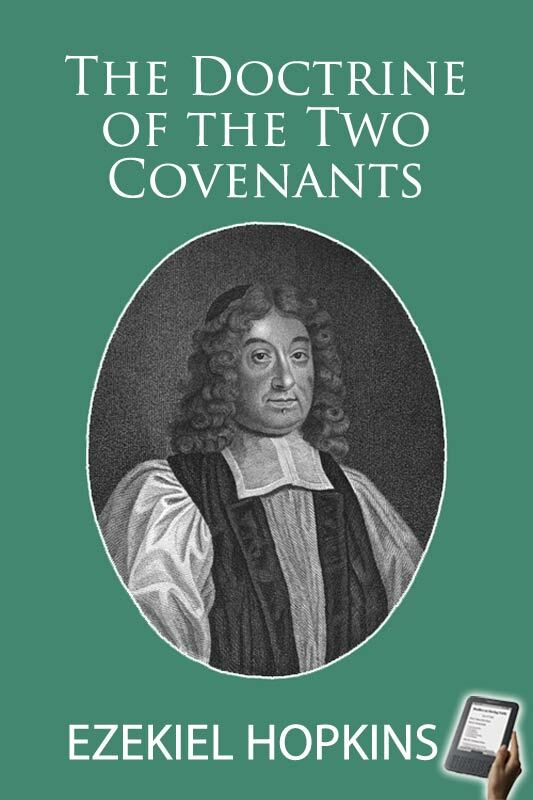 If one man covenant with another to serve him faithfully upon condition of such a reward and wages, though there may be much disparity upon other accounts between them, yet, as to the things covenanted for, there is none: the one having as much right to the wages, as the other to the service; and neither having right to either before the agreement. Secondly. In a proper covenant, there must be mutual consent of the persons covenanting. And this is called a stipulation, whereby each party doth freely and voluntarily engage himself to the other for his own particular benefit and advantage. For where both are free and disobliged it is generally the apprehension of some good that will accrue unto them, that brings them to enter into a federal engagement. First. Both parties covenanting are not naturally free the one from the other. Secondly. The creature's consent and agreement is not necessary to the covenant which God makes with it. And that, because the terms of it being so infinitely to our advantage, as there can be no reason imagined why we should dissent; so neither is there any to expect an explicit consent for the ratification of it. Neither are we lords of ourselves; but he, that made us; may impose on us what laws he pleaseth: and, if he condescend to encourage us by promises of reward, this voluntary obligation, which God is pleased to lay upon himself, lays a farther obligation upon us to do what he requires out of love and thankfulness, faith and hope, whereby we cheerfully expect and embrace what he hath promised: which, likewise, of itself, is so vastly transcendant and disproportionate to all our performances, that it cannot be our due, upon a strict and proper covenant (for, in every such bargain, the datum and acceptum, that which is promised by both parties, must be alike valuable, at least in the esteem of the covenanters;) but rather a free beneficence, upon an arbitrary promise. So that, between Man and Man, a covenant is a mutual and an equal obligation: but, between God and Man, it is only a mutual obligation; on God's part to a free performance of his promises, and on man's part to a cheerful performance of his duty: wherein, as there is no equality, either in right or value; so neither is there any necessity, that man should give an explicit and formal consent thereto. And, as God's transactions with us are not strictly and properly a Covenant, so neither are they strictly and properly a Law; although they are often called the Law of Works, and the Law of Faith. For God doth not deal with us merely out of absolute sovereignty, but he is graciously pleased to oblige himself to us by promise; which doth not belong to a sovereign acting as such, but carries some resemblance of a covenant. So that the agreement, which God hath made with man is not merely a covenant, nor merely a law; but mixed of both. If God had only said Do this, without adding Thou shalt live; this had not been a Covenant, but a Law: and, if he had only said Thou shalt live, without commanding Do this; it had not been a Covenant, but a Promise. Remove the condition and you make it a simple promise: remove the promise, and you make it an absolute law: but, both these being found in it, it is both a law and a covenant; though both, in a large acceptation. And thus you see what a covenant is; and how the transactions between God and man may be said to be a covenant; and wherein they differ from the proper notion of one. Yet the difference is not so great, but that the Scripture most frequently makes mention of covenants ratified between God and Man, and chiefly insists upon the two principal ones, which indeed are the argument and substance of the whole Bible, the Covenant of Works and the Covenant of Grace; in which not only particular persons were engaged, but the whole race of mankind: the summary contents of which were, Do this, and live; and Believe, and live. The former is the tenor of the Covenant of Works; the latter, the tenor of the Covenant of Grace. And both these are expressed in my text: the Covenant of Works is called the Righteousness of the Law; that is, the rule of Righteousness by the Law, the sentence of which is, that the man, which doeth those things, shall live by them: the Covenant of Grace is called the righteousness, which is of faith; that is, the rule of obtaining Righteousness by Faith, the purport of which is this, that if thou shalt believe on the Lord Jesus, whom God hath raised from the dead, thou shalt be saved.